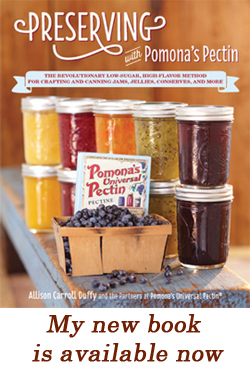 CanningCraft » Blueberry-Vanilla Jam on 207! I was back at the WCSH6 studios the other day, taping a new segment on Blueberry-Vanilla Jam for “207”. Since it’s winter, I’ve been making this recipe with frozen berries. And you know what? I actually prefer using frozen at this time of year, as I can use locally-grown berries. I froze a bunch last summer, but grocery stores around here carry Maine grown berries as well. This jam has become a new favorite around our house–it’s been disappearing from the fridge surprisingly quickly (Okay, I admit to a not-so-occasional spoonful right from the jar….and I suspect I’m not the only one!) Hope you enjoy it, too! ***Wash and rinse five half-pint jars, lids, and screw bands. Set screw bands aside until ready to use. Place jars in hot water bath canner, fill at least 2/3 of the way full with water, and bring to a boil. Sterilize jars for 10 minutes (add 1 additional minute of sterilizing time for every 1000 feet above sea level), then turn down heat and let jars stand in hot water until ready to use. Place lids in water in a small pan, bring to a low simmer, and hold there until ready to use. 1.) Rinse fresh blueberries if desired. If using frozen blueberries, thaw them, but do not rinse them. Then, in a large bowl, thoroughly mash fresh or thawed berries. 2.) Slice vanilla bean pod in half lengthwise and scrape out the seeds. Set the seeds and the pod aside. 3.) Measure out 4 cups of mashed blueberries. (If you have any left over, you can use it for something else.) Pour measured mashed berries into a large sauce pan. Add lemon juice, calcium water, vanilla bean seeds, and vanilla bean pod. 4.) In a separate bowl, combine the sugar and pectin powder. Mix well and set aside. 5.) Bring blueberries to a rolling boil over high heat. Add sugar-pectin mixture, then stir vigorously for 1 to 2 minutes, still over high heat, to dissolve pectin. Return mixture to a boil, then remove jam from heat. 6.) Using tongs or a spoon, carefully remove and discard vanilla bean pod. 7.) 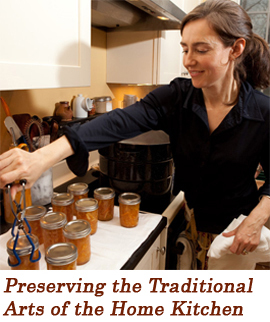 Remove hot jars from canner and fill jars with preserves, leaving ¼ inch of headspace. Remove trapped air bubbles, wipe rims with a damp cloth, and put on lids and screw bands. 10.) Allow jars to cool undisturbed for 12-24 hours. Then, confirm that jars have sealed. Enjoy your preserves! Or, store properly for later use.